A.R. Ammons was a member of a remarkable generation of American poets. Born in the 1920s, these poets came of age with the second world war and came to prominence in the 1960s, a decade with which some of their most characteristic work is still closely identified. They are now part of our cultural and literary history. 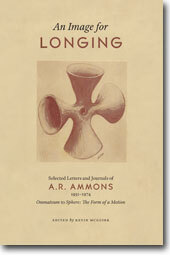 A generous selection of Ammons’s letters and journals, An Image for Longing will promote a renovated understanding of this important poet, sending readers back to his classic work with new appreciation, by drawing a picture of his career from its beginnings in the 1950s, through the 1960s, the decade of his remarkable ascendancy, to the culmination of its first phase with the publication of his major work, Sphere: the Form of a Motion, in 1974.